Taura Bairin (田浦梅林) is a park with Japaese plum forest located in Yokosuka. There are 2,700 plum trees and also 75,000 water lily. 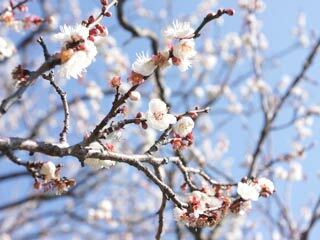 Around the end of February, both flowers bloom, and many people visit Taura Bairin to enjoy the arrival of Spring. There is restroom, but no parking. There is no parking anywhere near this park either. So, it's better to visit by train. 1. use JR Yokosuka Line to Taura. The park is located on the hill. On the top of the hill, there is an observatory which you can enjoy great view of Miura Peninsula.